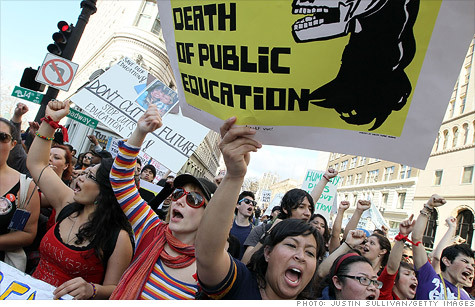 Student financial aid could be at stake if the U.S. defaults on debt. WASHINGTON (CNNMoney) -- College students heading back to school in the next few weeks could get caught in financial limbo if Congress doesn't make a deal to keep United States from defaulting on its debt. Nobody knows for sure what will happen. But student financial aid will be among the tough choices for Treasury, as it figures out what bills get paid, if Congress fails to meet an Aug. 2 deadline to raise the cap on federal borrowing and defaults on its debt. At stake is some $800 billion in student financial aid, ranging from Pell Grants to direct student loans. Even though many students have already gotten word of their grant or loan levels for fall semester, in many cases, the money hasn't been dispersed and won't be available until school starts this fall. "I don't think anyone's certain, exactly, what will happen," said Haley Chitty, spokesman for the National Association of Student Financial Aid Administrators. Department of Education spokesman Sara Gast said the agency is working with the Treasury Department, and can't yet offer details as to how financial aid could be impacted. University and community college lobbying groups say they're in the dark about what the federal government will do with financial aid and the impact on students. But some are urging students to ask lawmakers to protect their financial aid. "When they did away with summer Pell Grants, it had a devastating impact," said Norma Kent, spokesman for the American Association of Community Colleges. "Students in the middle of a certificate program suddenly had the rug pulled out from under them and couldn't get the jobs they had planned on." And cuts or delays to awards for the regular school year could impact far greater numbers of students. The current impasse could be particularly bad news for more than 8 million low-income students who qualify for up to $5,500 in annual grants. The Pell Grant program has been on the chopping block habitually since the Republicans took over the House. An earlier round of budget-cutting slashed Pell Grant awards for summer school. Rep. George Miller, a California Democrat, defended Pell Grant funding on Friday, calling it the "great equalizer" for millions of students. "Pell is the reason they are able to go to college and get ahead," Miller said. "It's a shameful excuse and an attack on middle class families."